What is the extract of Echinacea purpurea? Applied in the pharmaceutical field, Echinacea purpurea extract is mainly used as a raw material in the prevention of cancer, such as breast cancer, prostate cancer and colon cancer. Applied in the health care product field, Echinacea purpurea powder extract is mainly used in the improvement of osteoporosis and for women menopausia symptom. 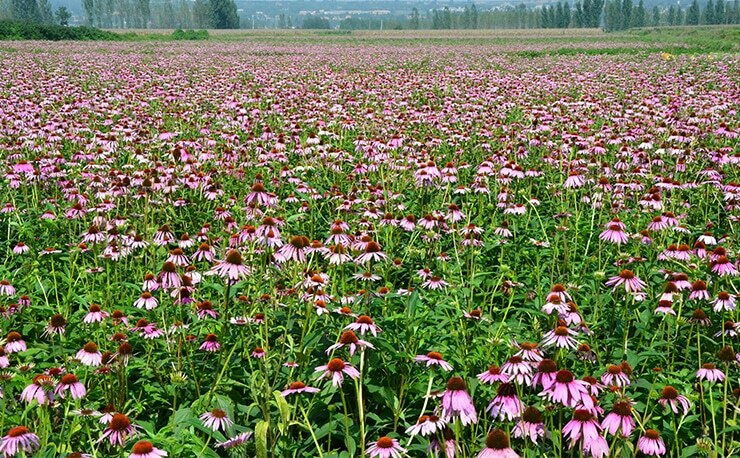 As an immunomodulator, Echinacea purpurea extract is widely used as raw material in the field of cosmetics. As food additives, Echinacea polyphenol is widely used in the food industry. The arrival of the first cold and temperature changes during the day lower the body’s immune system. This is the best time to put in place those natural cures that help to prevent the cooling diseases typical of the season, avoiding the use of drugs. Among the plant extracts that have proved to be most effective and safe, we can mention without doubt the Echinacea, a perennial plant native to North America. Its beneficial properties on wounds, burns and inflammation of the respiratory system were known and exploited since ancient times by the Indios populations. In recent years, several studies have highlighted the importance of supplements based on Echinacea extracts as an immuno-stimulating support to drug therapy usually applied. Pediatricians know well the functions of Echinacea and know that the combination of antibiotic with Echinacea extracts allows a faster remission in the case of chronic tonsillitis compared to the results obtained with the antibiotic alone. These substances are fundamental elements to look for on the label to be sure of the quality and functionality of the product. A product with extracts of Echinacea without titration in Polyphenols and Echinacoside, is not a guarantee of effectiveness. There are several types of plants of the genus Echinacea, among which the most important are the Angustifolia and the Purpurea; mixtures of both extracts are usually used to ensure the correct contribution of all the active ingredients. Echinacea extracts have been the subject of many scientific studies that have confirmed their ability to support and operate the organic defenses against pathogenic microorganisms in an optimal way. They act by stimulating the functionality of macrophages and lymphocytes, sentinel cells of our immune system, in counteracting specific bacteria and viruses. Echinacea polyphenol is an excellent natural adjuvant treatment for common diseases of the respiratory tract such as colds, coughs, tracheitis, ear infections and flu forms, when taken systemically (in the form of a dietary supplement). It is also a valid remedy in case of bruises, wounds, small burns and other skin diseases (warts and contagious molluscs) when inserted into topical treatments. Echinacea therefore has a non-specific immunomodulatory action able to fight infections of bacterial/ mycotic/viral origin, combined with a natural ability to stimulate tissue regeneration. The use of Echinacea has proven to be safe and effective even in the pediatric age: there are bibliography and texts from the past that describe its use in children from the first years of life. Children are the most vulnerable and can get sick several times throughout the year, as their developing immune system is continually challenged by frequent crowded public places and carycid pathogens such as schools, gyms and swimming pools. How to take Echinacea for a correct prevention of seasonal illnesses? Doctors and experts recommend taking Echinacea for prolonged periods as a preventive form, but with suspension times. repeat these prevention cycles 2/3 times a year. This modality is important in order not to make the body accustom to the presence of an external remedy, even if natural. In this way the immune system has moments in which it acts independently without the support of Echinacea, allowing it to learn and perpetuate the good work of our immune defenses.